Traditionally called the 'St Swithun Psalter' because it contains a prayer to the saint, this psalter's origins can be placed at Winchester, probably at the Cathedral Priory, which is dedicated to him. It is beautifully illustrated with a series of full-page tinted drawings which probably reflect the tastes and high social status of Hugh of Blois, Bishop of Winchester (1129-1171), patron of the arts, and brother of King Stephen. Hugh had been a monk at Cluny where sumptuous visual art abounded. The psalter, though, was made in England, having some details which relate back to 11th Anglo-Saxon manuscripts. Hugh of Blois may have used it as a prayerbook either privately or during the daily monastic prayers called the divine office. 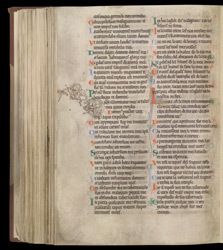 Psalters were divided into sections according to several traditions. By the 12th century, one of the most frequently seen types of division was the eight-fold or liturgical (for use in church services of monasteries), which is the division seen in the Winchester Psalter. The divisions are expressed by giving the psalm at the beginning of the division a large first letter and decorating the letter more lavishly than those of the other psalms. This page has the beginning of the second liturgical division, at Psalm 26 / 27 ("The Lord is my light"). The elegant decoration of leaves and stems is in the contemporary 12th-century style but it also looks back to decorated initials in 11th-century psalters from Anglo-Saxon England.